Your rings are such an important symbol of the unity created on your wedding day. 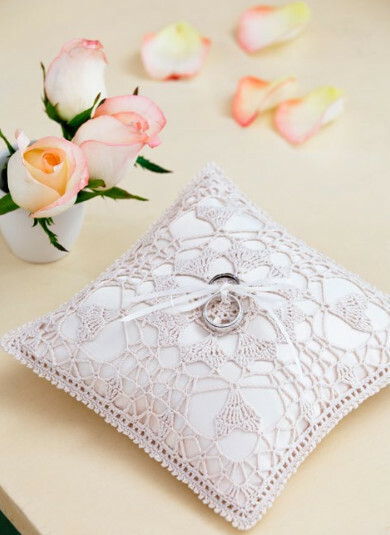 Cushion them in a beautiful way by using the Soft Doily Crochet Pillow Pattern to work up a gorgeous keepsake. This darling ring bearer pillow is the perfect wedding gift to give to the happy couple ahead of time to get them ready for the big day. Once the wedding is over, display this romantic memento in your new home to commemorate when two became one. Choose a yarn color to match your scheme, and this sweet detail will fit right in. Perfect for vintage weddings, this DIY wedding project is a classic. GAUGE: Rounds 1-5 = 1¾” (4.4 cm) across. CHECK YOUR GAUGE. Use any size hook to obtain gauge. NOTE: Work in your ends as you go or you will have a major job at the end. Extended Double Crochet (edc)=Yarn over, insert hook in next stitch, yarn over and pull up a loop, yarn over and draw through 1 loop; [yarn over and draw through 2 loops] 2 times. This will give you a slightly longer than normal dc. Extended Triple Crochet (etr)=Yarn over, insert hook in indicated stitch, yarn over and pull up a loop, yarn over and draw through 1 loop; [yarn over and draw through 2 loops] 3 times. 2-Double Crochet Cluster (2-dc cluster)=[Yarn over, insert hook in indicated stitch and draw up a loop, yarn over and draw through 2 loops on hook] 2 times, yarn over and draw through all 3 loops on hook. 3-Double Crochet Cluster (3-dc cl)=[Yarn over, insert hook in indicated stitch and draw up a loop, yarn over and draw through 2 loops on hook] 3 times, yarn over and draw through all 4 loops on hook. Picot: Ch 3, slip st in top of last sc made. Ch 4, slip st to form ring. Round 1: Ch 1, 8 sc in ring, slip st in back loop of first sc – 8 sc. Round 2: Ch 1, working in back loop only around, 2 sc in each sc around, ending with slip st in first sc of round – 16 sc. Round 3: Ch 3, hdc in same st, ch 1; *skip next sc, (hdc, ch 1, hdc) in next sc, ch 1*; repeat from * to * around, ending with a slip st into beginning ch-2 – 16 ch-1 spaces. Round 4: Slip st into ch-1 sp, ch 2; 2-dc cluster in same space, ch 5; *skip next ch-1 space, 3-dc cluster in next ch-1 space, ch 5*; repeat from * to * around, ending with a slip st into top of the 2-dc cluster – 8 ch-5 loops. Round 5: Ch 5, slip st in the 4th ch from hook, hdc in top of first cluster, ch 3, sc in next ch-5 space, ch 3; *(hdc, ch 4, slip st in top of hdc just made, hdc) in top of next cluster, ch 3, sc in next ch-5 space, ch 3;* repeat from * to * around, ending with a slip st into 2nd ch of beginning ch-5 – 8 ch-4 loops. Fasten off. Weave ends in. Row 1: Join thread in any ch-4 loop, ch 3, 4 tr in same loop – 5 tr. Row 2: Ch 3, turn; tr in first st, tr in next tr, 3 tr in next tr, tr in next tr, 2 tr in next tr – 9 tr. Row 3: Turn, sc in first tr, (dc, tr) in next tr, (2 tr, dc) in next tr, sc in next tr, slip st in next tr, sc in next tr, dc in next tr, 2 tr in next tr, (tr, dc) in next tr, sc in next tr – 15 sts. Row 1: Join thread in next ch-4 loop on Round 5 to left of previously worked Heart; ch 3, 4 tr in same ch-4 loop – 5 tr. Row 2: Ch 3, turn, tr in same st, tr in next tr, 3 tr in next tr, tr in next tr, 2 tr in next tr; slip st in sc at end of Row 3 of previous Heart – 9 tr. Row 3: Turn, sc in 1st tr, (dc, tr) in next tr, (2 tr, dc) in next tr, sc in next tr, slip st in next tr, sc in next tr, (dc, 2 tr) in next tr, (tr, dc) in next tr, sc in next tr – 15 sts. Row 2: Ch 3, turn, tr in same st, tr in next tr, 3 tr in next tr, tr in next tr, 2 tr in next tr; join with slip st to sc at end of Row 3 of previous Heart – 9 tr. Row 3: Turn, sc in 1st tr, (dc, tr) in next tr, (2 tr, dc) in next tr, sc in next tr, slip st in next tr, sc in next tr, (dc, 2 tr) in next tr, (tr, dc) in next tr, sc in next tr; join with slip st to sc of Row 3 of first Heart made – 15 sts. Round 6: Working towards the valley between heart points, join thread in the second tr of Row 3 of Heart; ch 4, dc in same st; ch 5, (dc, ch 2, dc) in the second tr on next point on same heart, ch 5; *(dc, ch 2, dc) in the second tr on first point on the next heart; ch 5, (dc, ch 2, dc) in the second tr on next point on same heart; ch 5*; repeat from * to * around, ending with a slip st into the 2nd ch of beginning ch-4 – 16 ch-2 sps. Round 7: Slip st into ch-2 space, ch 5, tr in same space, ch 2; (tr, ch 2, tr) in next ch-5 space, ch 7; (sc, ch 3 sc) in next ch-5 space, ch 7; (tr, ch 2, tr) in next ch-5 space, ch 2; (tr, ch 2, tr) in next ch-2 space, ch 2; (tr, ch 2, tr) in next ch-5 space, ch 2; *(tr, ch 2, tr) in next ch-2 space, ch 2; (tr, ch 2, tr) in next ch-5 space, ch 7; (sc, ch 3, sc) in next ch-5 space, ch 7; (tr ch 2, tr) in next ch-5 space, ch 2; (tr, ch 2, tr) in next ch-2 space, ch 2; (tr, ch 2, tr) in next ch-5 space, ch 2*; repeat from * to * around, ending with a slip st into the 3rd ch of beginning ch-5 – 4 ch-3 spaces. Row 1: Join thread in any ch-3 space on Round 7, ch 3, 4 tr in same space – 5 tr. Round 8: Working towards the valley between heart points, join thread in the second tr of Row 3 of any Heart; ch 1, sc in same st, ch 13, sc in the second tr on the next point of same heart, ch 7; (dtr, ch 2, dtr) in next ch-2 space, ch 2, skip next ch-2 space; (tr, ch 2, tr) in next ch-2 space, ch 2, skip next ch-2 space; (dc, ch 2, dc) in next ch-2 space, ch 2, skip next ch-2 space; (tr, ch 2, tr) in next ch-2 space, ch 2, skip next ch-2 space; (dtr, ch 2, dtr) in next ch-2 space, ch 7; *sc in the second tr on first point of next heart, ch 13, sc in the second tr on the next point of same heart, ch 7; (dtr, ch 2, dtr) in next ch-2 space, ch 2, skip next ch-2 space; (tr, ch 2, tr) in next ch-2 space, ch 2, skip next ch-2 space; (dc, ch 2, dc) in next ch-2 space, ch 2, skip next ch-2 space; (tr, ch 2, tr) in next ch-2 space, ch 2, skip next ch-2 space; (dtr, ch 2, dtr) in next ch-2 sp, ch 7*; repeat from * to * around ending with slip st in first sc of round – 4 ch-13 spaces. Round 9: Ch 7; *(sc, ch 4, tr, ch 2, dtr, ch 3, dtr, ch 2, tr, ch 4, sc) in next ch-13 space; ch 4, tr in next sc, ch 4; (sc, ch 4, tr) in next ch-7 space, ch 2, skip next ch-2 space; 4 tr in first ch of next ch-2 space, ch 2, skip next ch-2 space, tr in next ch-2 space, ch 3, sc in next ch-2 space, ch 3, tr in next ch-2 space, ch 2, skip next ch-2 space, 4 tr in first ch of next ch-2 space, ch 2, skip next ch-2 space; (tr, ch 4, sc) in next ch-7 space, ch 4**; tr in next sc, ch 4*; repeat from * to * around, ending last repeat at **; slip st into third ch of beginning ch-7 – 8 4-tr groups. Round 10: Ch 6, *etr2tog; ch 3, tr in same tr, ch 2; (3 tr, ch 3, 3 tr) in next ch-3 space, ch 2, skip next ch-2 space, tr in next tr, ch 3; etr2tog, ch 3, tr in same tr, ch 3, etr2tog, ch 3, tr in same tr, ch 5, 4-tr cluster worked in next 4 tr; ch 5, tr in next tr, ch 2, tr2tog, ch 2, tr in same tr, ch 5, 4-tr cl worked in next 4 tr, ch 5, tr in next tr, ch 3, etr2tog, ch 3**, tr in same tr, ch 3*; repeat from * to * around, ending last repeat at **; slip st into third ch of beginning ch-6 – 8 4-tr clusters. Round 11: Ch 1, sc in same st, *3 sc in next ch-3 space, sc between next etr2tog, 3 sc in next ch-3 space, 3 sc in next ch-2 space, sc in next 3 tr, 5 sc in next ch-3 space, sc in next 3 tr, 3 sc in next ch-2 space, 3 sc in next ch-3 space, sc between next etr2tog, 3 sc in next ch-3 space, sc in next tr, 3 sc in next ch-3 space, sc between next etr2tog, 3 sc in next ch-3 space, 5 sc in next ch-5 space, sc in top of 4-tr cl, 5 sc in next ch-5 space, 3 sc in next ch-2 space, sc between next 2 tr, 3 sc in next ch-2 space, 5 sc in next ch-5 space, sc in top of next 4-tr cl, 5 sc in next ch-5 space, 3 sc in next ch-3 space, sc between next etr2tog, 3 sc in next ch-3 space**, sc in next tr*; repeat from * to * around, ending last repeat at **; slip st in first sc of round – 304 sc. Round 12: Ch 3, skip next sc, dc in next sc, [ch 1, skip next sc, dc in next sc] 7 times, *[ch 1, dc in same sc] 3 times, [ch 1, skip next sc, dc in next dc] 38 times*; repeat from * to * 3 times; (ch 1, dc in same sc) 3 times; (ch 1, skip next sc, dc in next dc) 29 times; ch 1, slip st into second ch of beginning ch-3 – 164 dc. Block piece to a 7¼” (18.4 cm) square. Row 1: Ch 88, dc in 5th ch from hook, [ch 1, skip 1 ch, dc in next ch] 41 times – 43 dc. Row 2: Ch 3, turn; dc in next dc, [ch 1, dc in next dc] 40 times; ch 1, dc in the 2nd ch of beginning ch-3 – 43 dc. Rows 3-42: Repeat Row 2. Block to a 7¼” (18.4 cm) square to match Pillow Front. Cut 2 pieces of fabric 8¼” (21 cm) square. With right sides facing, sew the 2 pieces of fabric together using a ½” (12.7 mm) seam, leaving a 2-3” (5 – 7.6 cm) opening on one side. Turn right side out. Press if necessary. Stuff with fiber fill until firm but not hard. Do not over stuff pillow. Use needle and sewing thread to sew opening closed. With wrong sides facing and working through both top and bottom pieces, attach thread in any corner ch-1 space; *(sc, picot, sc, picot, sc) in same ch-1 space (corner made); [sc in next ch-1 space, picot, sc in same space] 41 times*, repeat from * to * around pillow, inserting pillow before working up the final side of pillow. Tie two 15” (38 cm) pieces of ribbon to the center of the pillow, trim ends. What a lovely idea. It is so delicate and would make a very pretty pillow for the rings. You can also make it to match your theme colors. Imagine a white pillow with your colors crocheted over it. My colors are peach so it would really show up. This easy, inexpensive project is for me! This gives me an idea for a wedding ring pillow. The pillow can be crocheted or it can be made of a lace cover. The pattern of the crochet cover is found right on the front page. Thanks for this idea.